The concept at Burger and Lobster is really simple. Serve a limited range of dishes which ensures freshness and speedy delivery. Overheads can be kept lower due to less wastage and purchasing economies of scale. These savings can then be passed onto the customer in the way of very affordable meals. This in turn draws in the crowds who know that they are getting a good deal. Add on a no reservations policy so the crowds will have to order drinks at the bar while they wait for a table. Genius! I just wish I had thought of it. Brilliant business model aside, Burger and Lobster really does offer up a good thing. The owners are the people from the popular steakhouse Goodman, and as you can tell by the name it only serves burgers and lobsters, all of which are priced at £20. There is no menu and the lobster comes as either a lobster roll or a whole lobster, steamed or grilled, and with a choice of two sauces. And if you are particularly hungry, an extra £10 affords you a 2 kilo lobster rather than the standard 1.5 kilo option. All meals come with salads and fries. The wait for our table lasted about an hour, during which time we hung out at the too-crowded bar. Mind you, the cocktails were snazzy and reasonably priced at about £9 (we were in Mayfair). Despite the wait, I have to say I adore this place. Burger and Lobster has a lovely warmth to it and the staff are super friendly. We both went for the whole steamed lobster. There didn’t seem much point getting anything else as indisputably this is the best value item in the restaurant. Being 1.5k there was a fair bit to get through, albeit the body of the lobster was a touch rubbery. Nevertheless, the lobster was tasty and it was fun to tuck in and get your hands a little messy. Most of the cracking is done for you before serving so it wasn’t too hard work. The fries were sensationally good and super crunchy – a dieter’s nightmare as they were really hard to resist. The salad topped with shaved parmesan and croutons was delicious too. Only the garlic and lemon sauce was a bit of a let down as it merely resembled melted butter. The service was endearing and for an added bit of fun, you get a bib too. And it was filling. We couldn’t extend ourselves to dessert which was a choice between cheesecake and strawberry jelly, again good value at £4. This wasn’t the best lobster on earth, but it was very good lobster and probably the best value lobster in London at the moment. £20 for a great all-round package? It’s won me over. 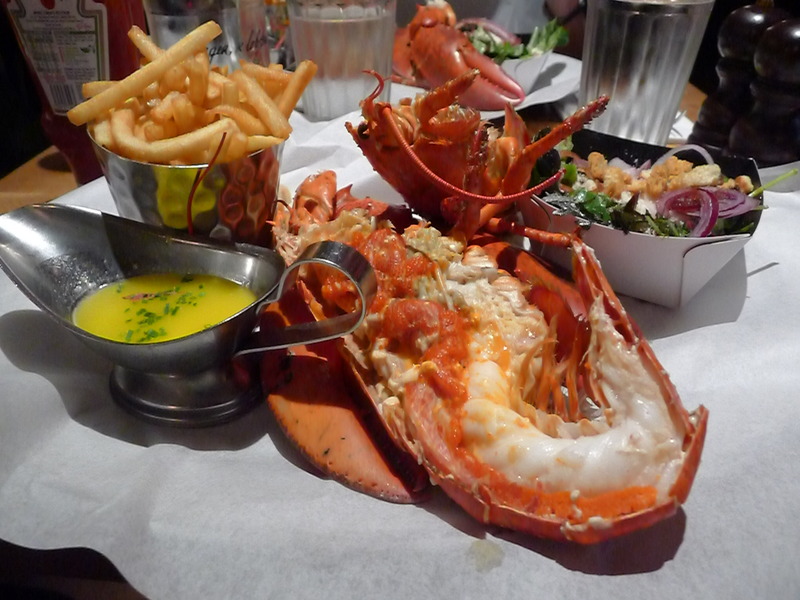 Price range: £20 for burger or lobster. £10 to up size the lobster. Excludes drinks and service. Sounds like a really cracking place. I made a note to drop by the place sometime soon. You are right, they may not have the best food but everything is worth it. Yeah I’d definitely go again! This looks like a great place to try! I live in Paris but next time I’m in London, I’ll try and go there. thanks. I also liked Benedicts too! yes you should try Burger & Lobster. It is really great fun.